Of all the places in the world I have travelled, the great rainforest of British Colombia is certainly the one which offers the greatest opportunities to observe varied wildlife in very good conditions. Far from the observation hides of northern Europe, to which bears are attracted with bait, I was able to approach and several times was allowed to get close to both black bears and grizzlys, thanks to my local guides for whom this vast forest is their ancestral home. 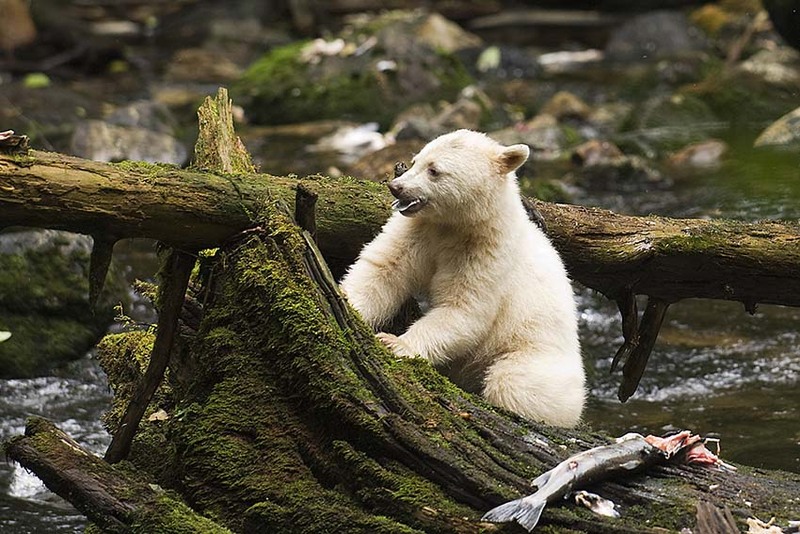 I invite you to travel with me for an exclusive week in British Colombia in the month of September, the time of year when the Pacific Salmon makes its arduous way up the rivers and waterfalls, causing a veritable frenzy amongst the bears. Wildlife watching and the discovery of the Great Rainforest are not the only strong points of this voyage, however. Beyond the bears, we may very likely encounter bald eagles, seals, wolves and even cetaceans. This trip is also a unique opportunity to immerse yourself in the culture of the First People of the northern Pacific coast. Our accommodation will be in a typical village, where totems telling the history of the ancestors are still to be seen, and we can attend traditional dance performances in ‘the Big House’. Our hosts during this journey are descendents of the First Nation who populated the north Pacific coast from what is now British Colombia to Kamchatka, through the Aleoutian Islands, long before the arrival of the white man. They know this land better than anyone, and it is theirs. Whether you are a photographer or a traveller, this is a unique opportunity to explore it with them.